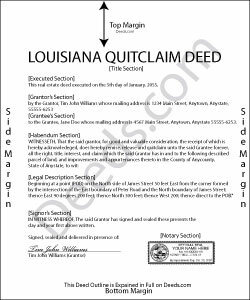 The state of Louisiana defines the minimum requirements to execute a lawful quitclaim deed in Civil Code 1839: an authentic act entered into the public record by formal recording. An authentic act is a written agreement, executed in the presence of a notary or other authorized official and two witnesses who are not otherwise part of the transaction. The code goes on to state that all grantors must sign the deed, and the name of each signor must be typed or printed immediately beneath the signature. CC 2503 states that every sale includes a warranty against eviction, so ensure that the lack of title guarantee is noted in the body of the document. CC 3352 codifies other requirements: the full name, domicile, and permanent mailing address of all grantors and grantees; the marital status, including spouse's full name (if any) of all parties; a statement detailing any change in the grantor's marital status; a complete legal description and the municipal ID or address of the property; and the ID number and typed, printed, or stamped name of the notary or attorney. These requirements are further supported by Louisiana Revised Statutes 35:11, 12. Finally, it is customary to include a recitation of the consideration (usually money) paid by the grantee. Louisiana follows a "race" recording statute, which basically means that the first to record a deed holds the priority for ownership in the event of a dispute. For example, let's say the grantor quitclaims the property to grantee A, who fails to record the deed. Then the grantor quitclaims the same property to grantee B, who records it immediately. Even if grantee A tries to record the earlier document, grantee B's claim holds higher priority because it was recorded first. CC 517 asserts that the voluntary transfer of ownership is not fully effective without entry into the land records of the parish where the immovable is situated. CC 2442 restates this, explaining that the "parties to an act of sale or promise of sale of immovable property are bound from the time the act is made, but such an act is not effective against third parties until it is filed for registry according to the laws of registry." Recording land transactions is also important because it helps to preserve a clear chain of title (ownership history) which will likely make the process for future conveyances smoother. In short, recording the quit claim deed as soon as possible after it is executed is an effective way to preserve the grantee's rights in the land.